When Benjamin Franklin came up with this little piece of wisdom, I’m fairly certain he wasn’t using it as a way to examine the efficacy of corporate learning environments. And yet it is incredibly true. He knew just as well as we do that people only retain a fraction of what they hear. During a recent discussion with learning content provider Learnkit, the company’s leaders discussed “nano courses,” a short and targeted method for reinforcing a learning event and ensuring training is top of mind. This sort of option is growing in popularity not only due to the speed of implementation and the digestible size of the content, but because of something much more critical and commonplace: forgetting. People forget. It’s a fact of life, and it’s a scary proposition for those developing training everywhere. Consider the size of your training budget. Now take half of it and throw it out the window. That’s a fair approximation of what happens when learners forget half of the content they are provided. As you can see in this image, the blue line is the typical forgetting curve. We retain a portion of what we learn initially, but it tapers off relatively quickly in just a few days. 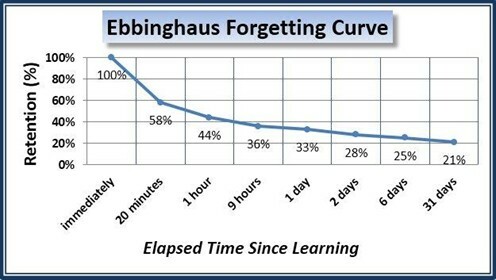 However, if we have a targeted reminder (such as the nano course mentioned above), then we have the ability to reset that forgetting curve, flattening it slightly so that retention is improved. 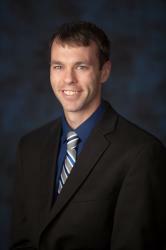 A continuous stream of small bumps over time will ensure the proper knowledge is not only retained, but top-of-mind. In addition, regular boosts to learning will keep the topic and content fresh while still fighting the ever-present forgetfulness. This is also where some organizations are using adaptive learning to meet this specific need. A personal example is through the use of language-learning app Duolingo. I am going to be visiting Guatemala in the coming months, and I’m steadily trying to hone my Spanish to at least a workable level. Duolingo is my app of choice for learning on the go, and it involves games, exercises, and other interactive elements to keep learning fresh and engaging. In addition, it knows what words I know and which I have trouble with, surfacing those challenging ones at regular intervals until I have mastered them completely. It periodically injects other words, even ones I have demonstrated competence in previously, just to make sure they are not forgotten over time. As evidenced by the Franklin quote above, there are other options for creating a learning experience that is truly unforgettable. The more we can involve people in what they learn, the more they retain. That has been my experience with this application, and I’m willing to bet many learners within your organization would be interested in an engaging learning experience beyond a simple lecture. It can be anything, including a collaborative experience, an action learning project, or something more. Imagine for a moment that half of what you are telling people is going to be forgotten within a few days—how would that affect your structure, content, and delivery? What would you do differently to ensure that the pieces of content people retain are the critical components of your training?